Te Papa Research Fellow Patrick Brownsey and I have just described a new species of fern, Lastreopsis kermadecensis. It only occurs on Raoul Island, which is the largest island in the Kermadec Islands group. Hence, the second part of the new species name! Lastreopsis kermadecensis looks similar to New Zealand’s smooth shield fern, Lastreopsis glabella. 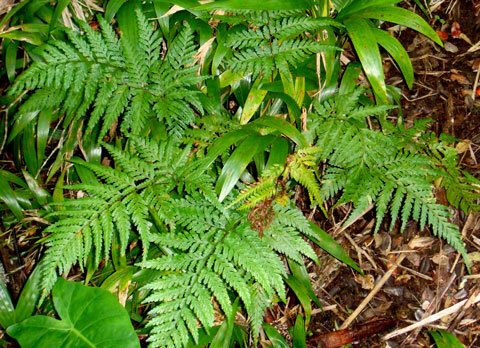 Lastreopsis glabella is a common forest fern. You will have undoubtedly seen it if you’ve spent any time in New Zealand’s forests, even if you didn’t recognise it. One of the differences between Lastreopsis kermadecensis and Lastreopsis glabella is that the latter has an abundance of small, orange glands on the undersides of its fronds. Lastreopsis kermadecensis is actually most similar to Lastreopsis smithiana from eastern Australia, but there are several differences which we felt were sufficient to treat them as distinct species.